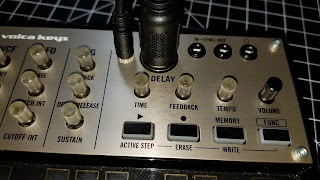 I bought a MicroKorg off eBay, and got it cheap because 10 of the keys didn't work. It's always a gamble with "as-is" tech that's sold for parts, and this time, I lost. I was hoping it was just dirty contacts, since the MK looked kind of beat up. 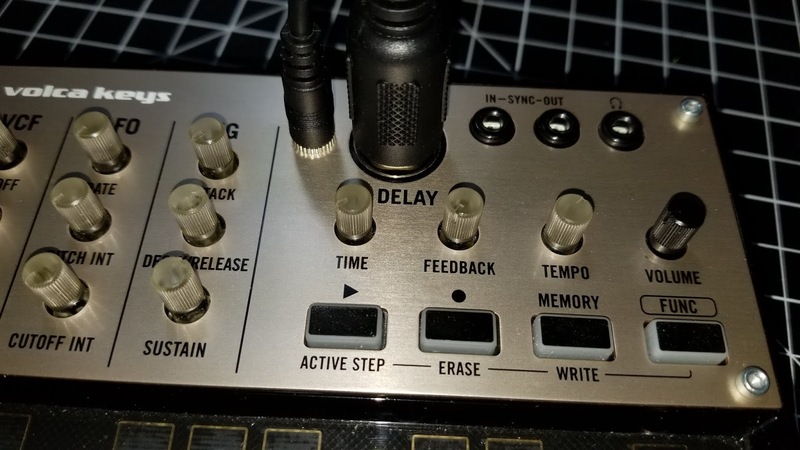 I figured that since it worked otherwise, there weren't any bigger problems than the contacts, and I could always use a MIDI keyboard if I had to. 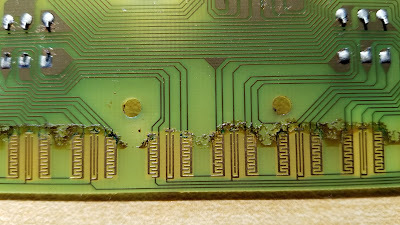 When I opened it up and took a look at the keybed, I found that an old liquid spill had eaten away at the traces. 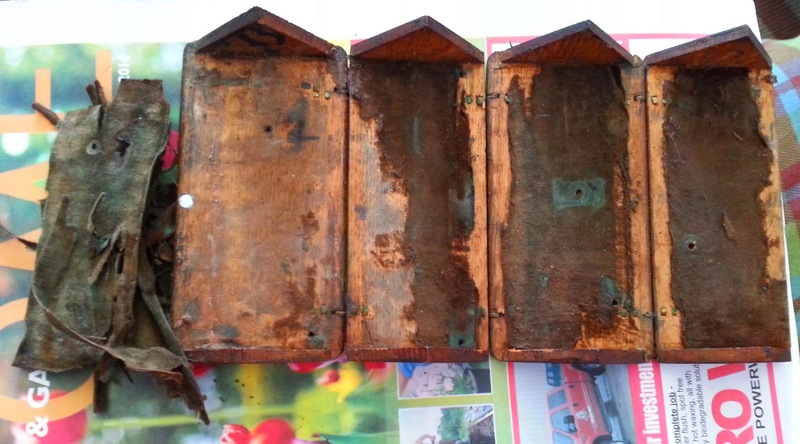 There was some bubbling under the surface, and tiny bits of the copper traces had long ago flaked off. I did attempt to clean the board and re-connect the traces with conductive paint (and failing that, solder) but it wasn't meant to be. Whatever it was, it was still kind of gummy. I think it was beer. 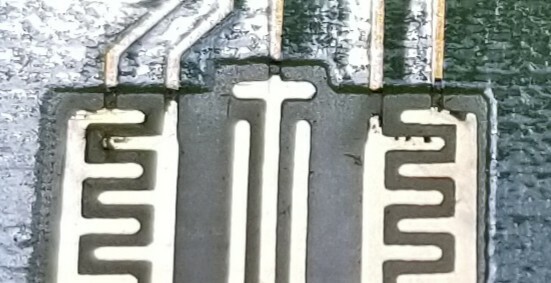 Here's a closeup of the broken traces. I could see the spaces when I held it up to the light. I decided it wasn't the end of the world if I chopped off the mini keys and turned the MK into a desktop unit. Since that's probably why you're here, I'll get right to the steps. A radial arm saw or something that will cut straight. Really. Seriously. Unscrew and remove the wood cheeks. 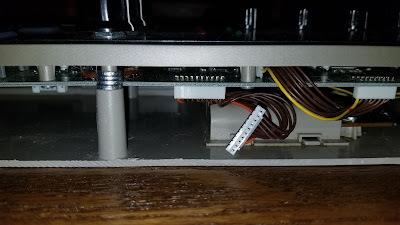 Take the base off, disconnect the two molex plugs that connect the Pitch/Mod wheels and keybed to the MK proper, and take the main board out of the case. We'll be cutting the plastic case, so we don't want random bits all over the circuits. There are plenty of disassembly videos and walkthroughs online, so have at it. 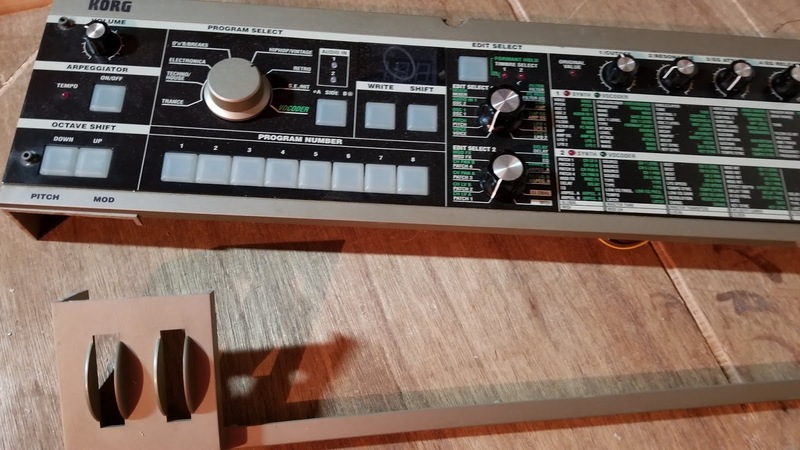 You don't have to remove the metal panel with all the knob labels, so there's a small comfort. You only have one case to work with, here, so be careful. Looking at the top of the case, there is a lip across the front above where the keys were. I used that as a guide, marking off a straight line across the left side where the Pitch/Mod wheels were, and the right side, where there's a slim part that the wood cheek is screwed to (don't cut the wood cheeks yet, remove them!). See how the lip comes down behind the keys? We want to keep that. Also, this MK is fully assembled. Don't be that guy. The cheeks are something I'll address later--you'll have to trim them down, just not yet. I used a radial arm saw to cut from each side because for some reason I actually have one. I was a little generous on my cut on the left side (you can see the extra bump in the photo below), and needed to sand down some extra plastic. When I was done, the top lip stretched from side to side. That's going to come in handy later. You may have noticed I didn't remove the MK's innards. Be smarter than me. The base is the same thing. I foolishly tried to score it with a razor, but my cut went crooked. I'd recommend that if you can saw it along a straight guide, do that. Step 3: Make the front panel. I used a piece of oak moulding from a hardware store for this. It's a little over 1cm thick and already bevelled. I measured across the case to make sure that when I cut it, the front panel would be flush with the left and right edges. 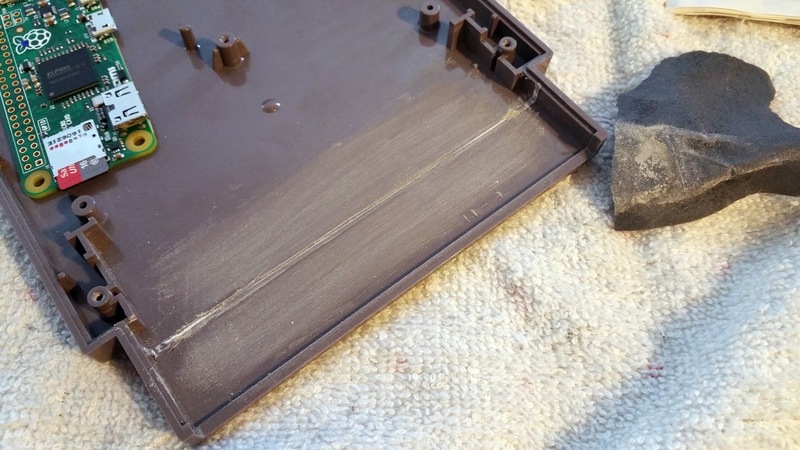 Once it was cut, I had to trim off another 8mm or so from the bottom, leaving about 1-2mm sticking up (and down) past the plastic case, like the wood cheeks do. I sanded it smooth, since the plan was to stain it in an attempt to match the original wood cheeks (I was marginally successful using a cherrywood stain, though I think Korg were going for walnut originally). You can make it whatever height you like, of course. Step 4: Fit it all together. Without the keybed in place, the plastic case has nothing in front to keep its shape. If you tighten the four front screws, the top cover will collapse inward. To counter that, I used four small washers stacked together to make a spacer for each of the screw posts in the front. 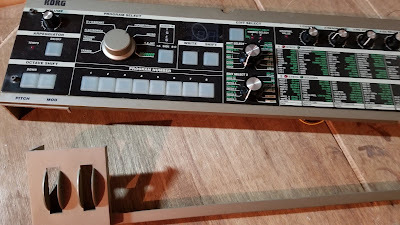 Once I had that figured out, I reassembled the MicroKorg. You can see the washers I used to keep the top from bowing in, as well as the unused Molex connectors for the Pitch/Mod wheels and the keyboard. Those you can just tuck into the case. Here's the full length. I've already cut the wood cheeks, but I cut them for a thicker front panel that I ended up hating. An article I saw elsewhere said to drill holes into the screw posts and use those to mount the front panel. I didn't want to weaken what's already a rather flimsy plastic case (and also aim so precisely), so my solution was to cut three wood pieces from 1cm (1/4") thick scrap wood to use as mounting blocks. Literally one screw holding it at the bottom. 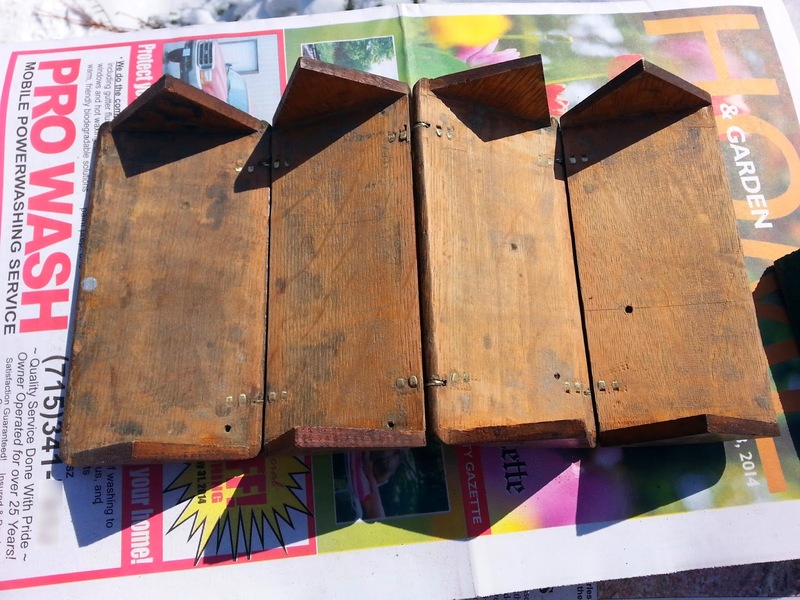 They're 3-4 cm wide, and tall enough to span from the base to the top when wedged inside. 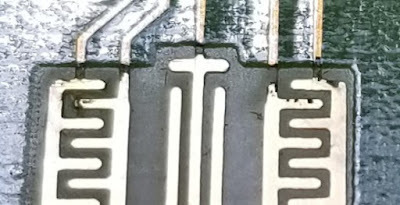 I had to cut a notch into the top of each one to make room for the mainboard--it comes very close to the front of the MK. The front panel will actually screw into the thicker part of the wood spacer. Here's one of the wood spacers in place (the notch is on the other side at the top, against the mainboard). Notice how the spacer is only screwed into the bottom panel--the top is held in place by the plastic lip. Here's the spacer with my original, too-thick front panel in front of it, hole drilled and ready to go. 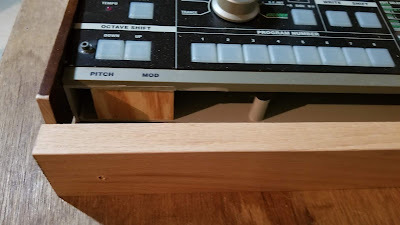 I used a single screw to screw each wood piece in place from the bottom of the MK, trying to keep the wood 1-2mm in from the front to account for the overhanging lip on the top panel. That didn't work too well, but it's all inside, so whatever. I marked the front panel about 3cm in from each side, trying to keep them centered vertically, and drilled some small screw holes. 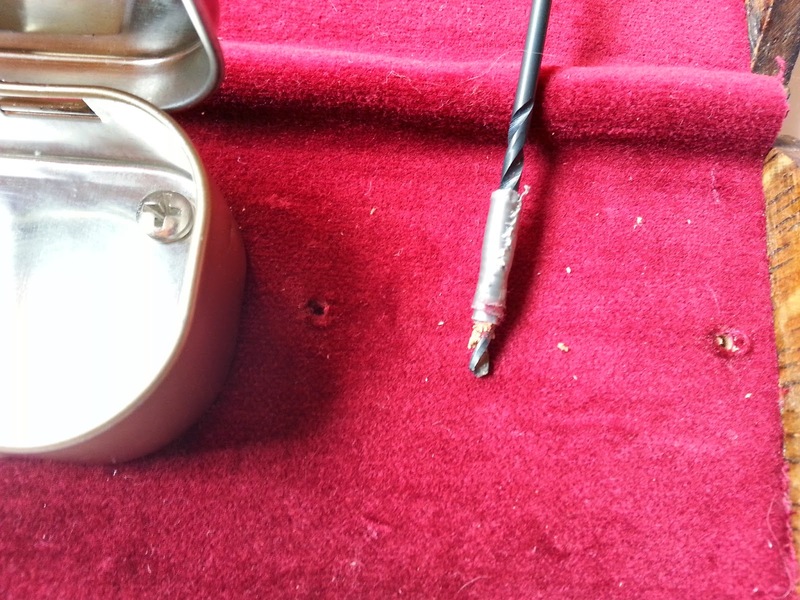 To countersink the screw holes, I used a larger drill bit, a little thicker than the diameter of my screw heads. Then I attached the front. I took this photo after it was all stained and reassembled, but you can see the inset screw. 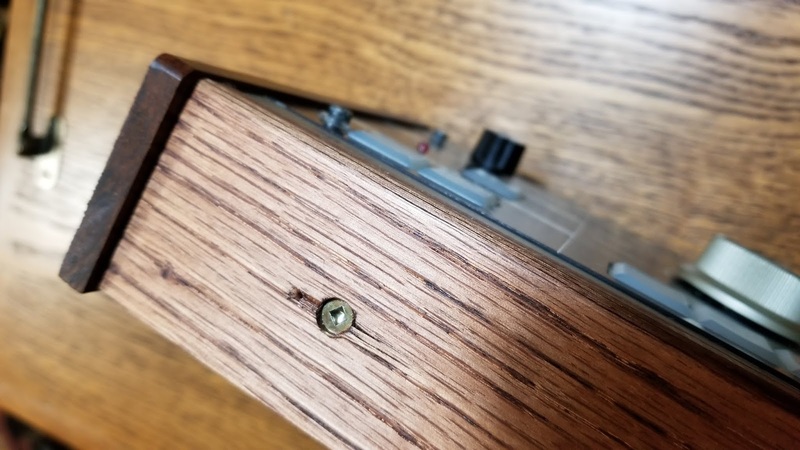 The screw at the bottom of each wood spacer keeps it in place at the bottom, and the lip on the top panel of the MK does the same for the top, pulling the front panel in without having to drill anything into the top panel. It's all sturdy enough to give you something solid to mount the front panel. With just two screws holding in place, I can carry the MK around by the front panel. I reattached the cheeks and marked off where to cut so they stuck out about 2mm in the front (you can see that in the photo above). I then taped them back-to-back and sawed them off, using an electric sander to round off the top front corners. Then I measured about 2cm from the bottom and 2.5cm from the front, and drilled new mounting holes, using the larger-drill-bit technique to sink them. That way I could use the original screws. 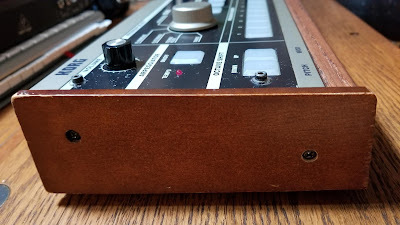 I screwed the back part of each cheek in place and used double-sided tape to keep the front from moving once it was lined up, then drilled through my pilot hole into the plastic case. Using the original mounting screws (you'll have a couple longer screws left over from pulling the keyboard if you want to use those), I attached the front of each cheek. The original hole, upper left, and mine, lower right. I didn't want to drill into my front panel for I don't know why. That's it. 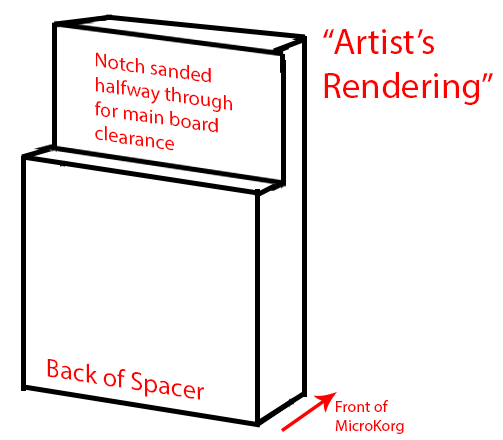 Most of this is done to your taste, so if you want to use something else for a front panel or replace the original cheeks or add a PEZ dispenser, that's yours to decide. 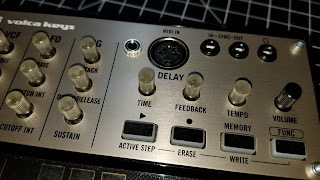 I think the only thing I really have to add to the larger "MicroKorg mods" conversation is my solution for mounting the front panel as invisibly as possible, and maybe warn you about the case flexing without spacers. I did have a third wood spacer in the center, but screwing into it would put the front mounting screw off center (there's a screw post just to the right of center, so it would be a tight fit). Luckily, the two screws seem to hold the front panel on tightly enough that I don't have to offend my aesthetic by having a single, off-center screw in the front. I'm sorry I didn't take more photos, but have fun modifying your MicroKorg! I saw Zach's writeup on his Pi Cart RetroPie build, and just had to try it. Definitely follow his instructions--they're really easy, and he covers a lot of the potential pitfalls. This post doesn't cover anything new, I just figured I'd document my foray into what it was like to put one together with stuff I had on hand. The second hardest part of this project was getting my hands on the Pi Zero, since Adafruit has them in and out of stock at random. The hardest part was winding all the cables inside the cart to make everything fit. As usual, click on the photos to make 'em bigger if you want to. Zach's instructions use an Amazon Basics 4-port USB hub, which is only about $6. But I have USB hubs lying around, so to keep costs down, I used one that had two ports on one side and two ports on the opposite side. 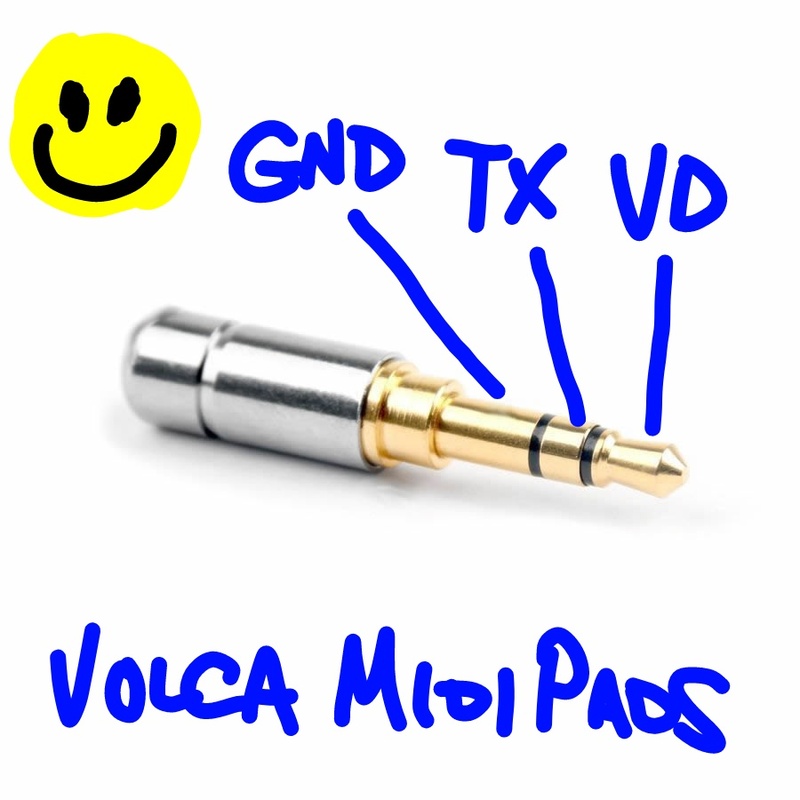 This way I could plug the WiFi dongle in at the back and add a bluetooth dongle later if I wanted. Power usage is a concern, though, so I probably won't. All you really need is two accessible ports for two controllers, and you can always unplug a controller to update ROMs via USB drive. Before you start, maybe test the Pi to make sure it works. 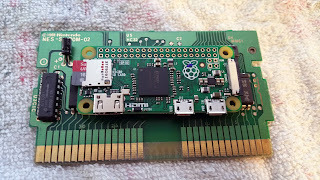 I've never had a problem with any Raspberry Pi boards, but you never know. 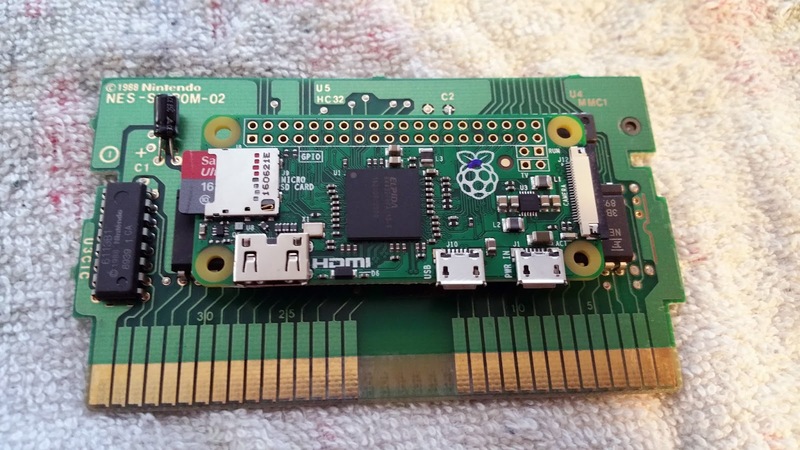 Download the RetroPie image (you want the Raspberry Pi 0/1 version for the Pi Zero) and follow the instructions on the RetroPie page for installation. 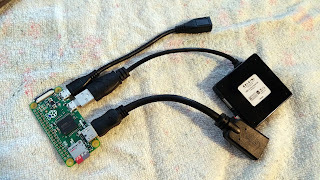 Plug the card in and boot the Pi, ideally with a controller attached. If everything works, assemble your PiCart! I got everything together and opened up the cart using the security bit. There are a few free alternatives online for opening the cart, but trust me, buying the security bit or screwdriver is worth it. There isn't a whole lot of room inside an NES cart, even though the thing is mostly filled with air. I pulled out the original game board and marveled at how big it was compared to the Pi Zero. 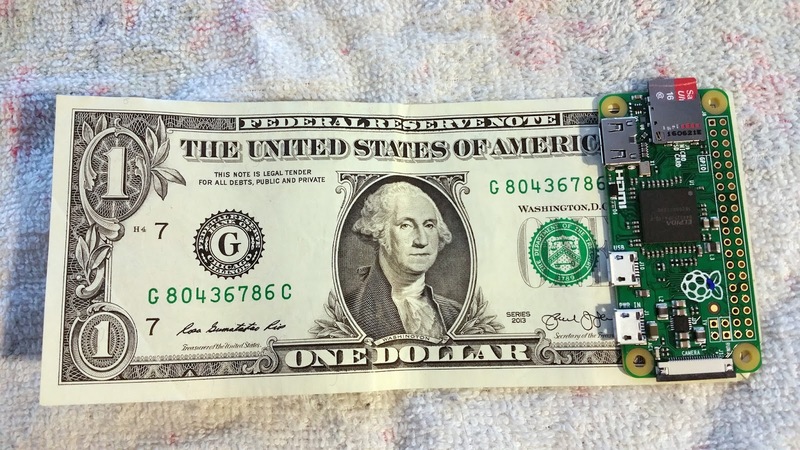 The Pi Zero needs to be held to be believed. It's about the size of half a graham cracker square. Or about a fifth of a dollar bill. I laid down a towel so the tiny parts wouldn't bounce away too easily, then got all the pieces out to assemble. The cables were all stiff and new (especially the HDMI adapter), so I figured I was in for a challenge. I started by following Zach's instructions, and kept modifying as I went, since I was using a different hub and cables. 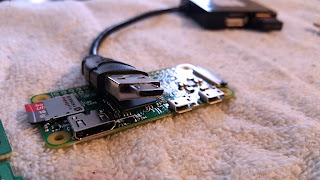 The HDMI adapter connected to the Pi, the USB adapter plugged the hub into the Pi, and the male-to-female Micro USB adapter felt way too short...but would probably work. 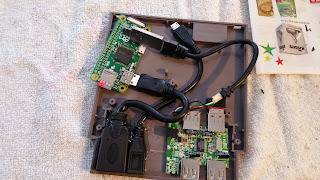 I was originally planning to keep the shell on the USB hub, since it seemed to fit as it was, but I decided to open it up to create a little extra air flow. The Pi Zero runs pretty cool, and it won't be handling any demanding games, but it does warm up while you play. 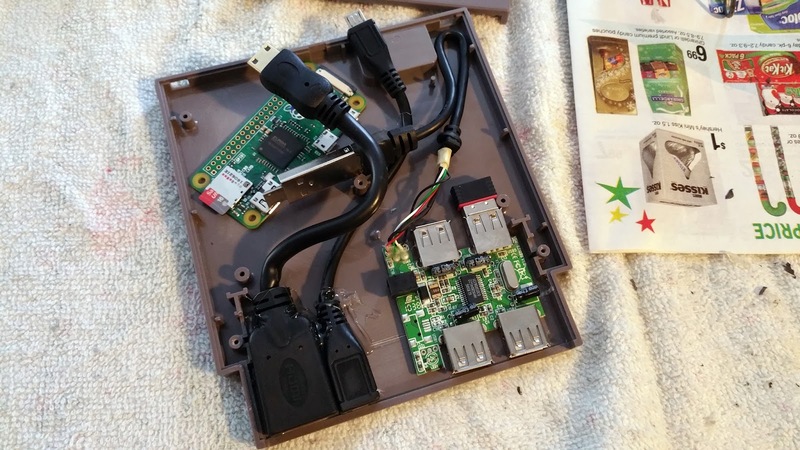 This RetroPie will be set up to play the classics, because nostalgia. Those were the best games anyway. Don't judge me. 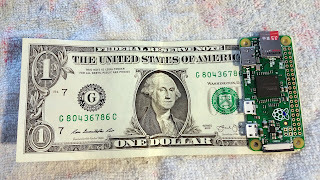 The USB hub isn't powered, and the Pi Zero doesn't put out a whole lot of extra power, so I scrapped the plan to add a bluetooth dongle. I wanted to keep the Wi-Fi dongle, though, for updates and metadata scraping. I scored the divider on both halves of the cart, then pushed it to snap it off. It actually broke pretty cleanly. Then I sanded it smooth, mostly to rough up the plastic to give the hot glue a bit more purchase. The Pi goes right about there. Then I spent a stupid amount of time just moving stuff around and bending wires to find the best fit. There's really no preparing for this, you just have to figure it out through trial and error. The HDMI cable is NOT very flexible, so that took precedence. I was able to wedge it against the middle screw post to keep it bent. I eventually got down to figuring out what to layer and how, making sure the USB cable threaded underneath the HDMI adapter cable. The HDMI had to wind over the corner of the USB hub's PCB, so I figured the natural gap underneath would be enough room for the Micro USB adapter cable. 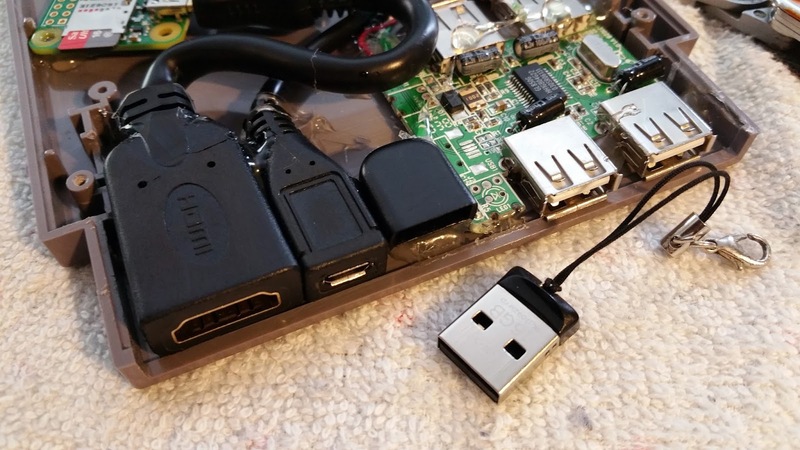 I hot-glued the HDMI, Micro USB adapter, and USB hub in place at the front of the cart. They had to be there no matter what, so I figured with them glued down I'd have a better grasp on how the cables had to run. 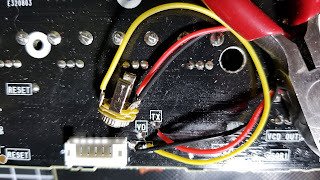 I built up a small layer of hot glue under the USB hub to raise it up a bit before gluing it in place. The Wi-Fi dongle fit nicely against one of the other mounting posts inside the cart. That upper left USB port stays unused. 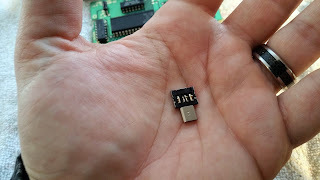 I ended up shaving flat the HDMI adapter and peeling the excess plastic off the USB plug on the USB hub. They were both just too thick, and with everything contained within the NES cart, they wouldn't be exposed to the elements or physical abuse. I might have shaved a bit too much off the HDMI cable and damaged the shielding; time will tell. I also had to break off the power input on the USB hub to make room for the HDMI cable, and in doing so, I took out what looks like a fuse. The hub still works, though, so I'm going to optimistically assume it was a fuse for the now-missing power port. The Belkin USB Hub I used had a ridiculously long, metal USB plug under the plastic. It's that entire 2" metal thing in the second photo below. Really, who asked for that? Once the cables were mapped out and mostly in place, I adjusted the Pi to put as little stress on the plugs as possible and marked the mounting holes by digging the end of a push pin into the plastic of the cart. I placed hot glue blobs over the marks, let them dry, then plugged in all the cables, positioned the Pi, and (holding everything so it didn't move) pushed more hot glue through the mounting holes to fix it in place. 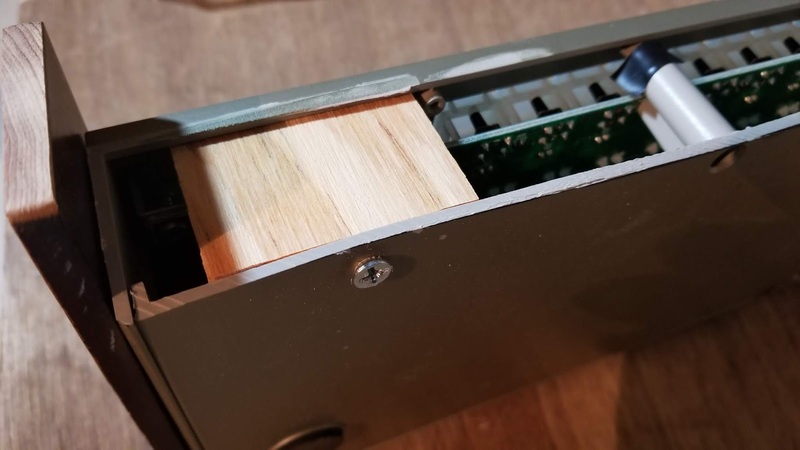 With just the four points glued down, the Pi would be easier to separate from the cart if needed, and it would have some air flow all around it while it worked. 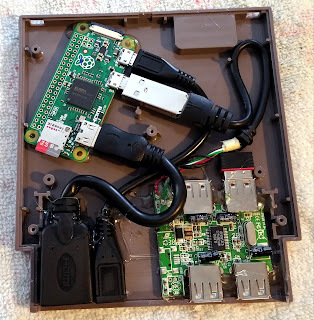 I wasn't too concerned with only two exposed USB ports, since all functions can be done with two--ROM load and controller or keyboard, or a two-player game. The Wi-Fi dongle was inside, so technically didn't take up any space. It's like a secret bonus functionality, and it's less likely to get lost in there. I put a dot of hot glue behind it so it wouldn't get jarred loose. Having only two USB ports left a big ol' gap in the front of the cart, though. 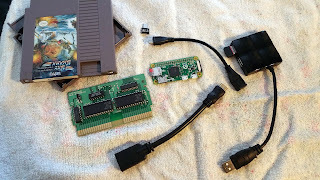 I wanted this to be a self-contained kit with a dedicated USB drive for transferring ROMs, so I figured I'd hot glue the cap for the USB drive in place as a kind of dock. That way, the USB drive can't get misplaced quite as easily. I left the string attached, clipped off the metal bit, and the string can be tucked inside. Obligatory note on ROMs: Downloading them is shady at best. They're out there, but play fair. What's nice about the RetroPie is having all of my favorite games in one place, on a system that can plug into my new TV without a UHF adapter. If it's so handy, why am I keeping all my original consoles, carts, and discs? Because nostalgia. Don't judge me. If there's a fire, I'm totally jumping out the window clutching my SNES. The cat can fend for itself. The only thing left was to reassemble the cartridge. I meant to buy a few phillips screws to replace the Nintendo security screws, but never got around to it. The Pi Zero performs really well for anything up through the Sega Genesis/Megadrive era. With two controllers plugged in, the hub works with no power issues. I was able to scrape a bunch of cover art via Wi-Fi with no hiccups. Kudos to Zach for coming up with an easy-to-follow idea. The Pi Cart is a head-turner and a fun (and portable) way to play with your RetroPie build. I did this one as a Christmas present for a friend of mine, and he was really happy to get it. 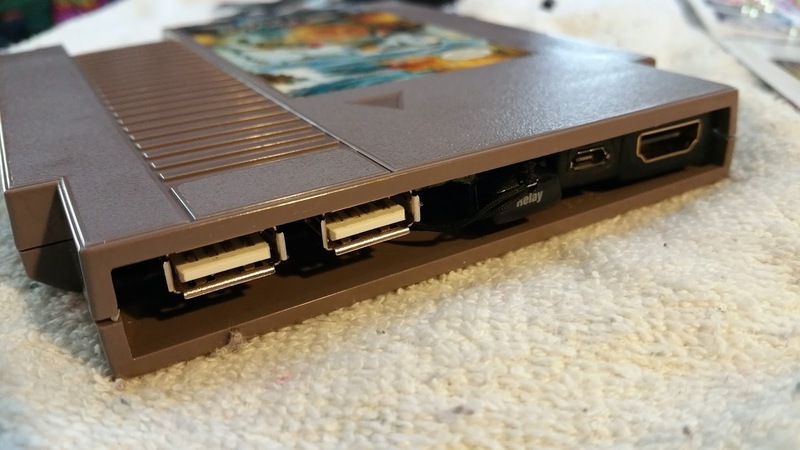 It sits nicely in his current library of NES cartridges as a sort of stealth option for when he gets tired of blowing on the real carts to get them to play. It's nostalgia. Don't judge him. I'm writing about this because I didn't find one place online that explained all this stuff at once. I bought my wife a few Game and Watch games for Christmas this year, and one of them was sight unseen--the seller didn't have the batteries or urge to test it, but it seemed in good shape. 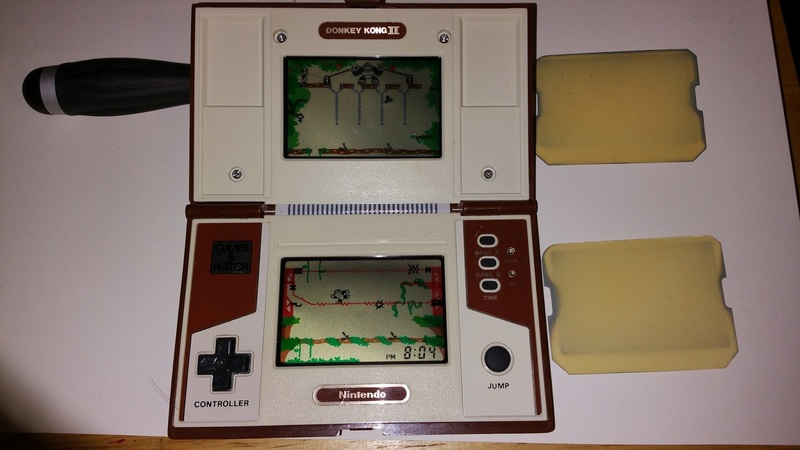 When I put batteries in it, though, I couldn't see the screen. At first, I thought it was completely dead, but it made sound. When I looked closer, I could make out really faint figures moving on the screens. This meant the polarized film over the screen was toast. Super easy fix. 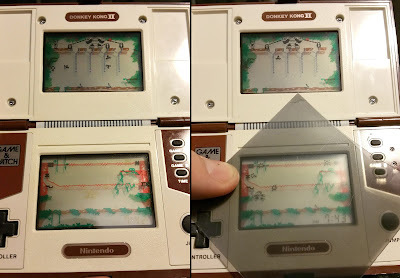 If you have a Game and Watch with a fading LCD, here's what to do: get something polarized (like sunglasses) and place it over the screen. You might have to rotate it a little, and you should see the screen go black on one of the angles. Rotate another 90 degrees and you should have a normal looking screen with DK Jr. bopping around on it. Here's the lower screen with the old and new polarized film. I bought a pack of 10 sheets of polarized film on Amazon. They're a bit thicker than the originals, and as you can see by the photo above, I had to use them diamond-shaped to get the angle right. I figured I had to trim them anyway, so I was fine with that. 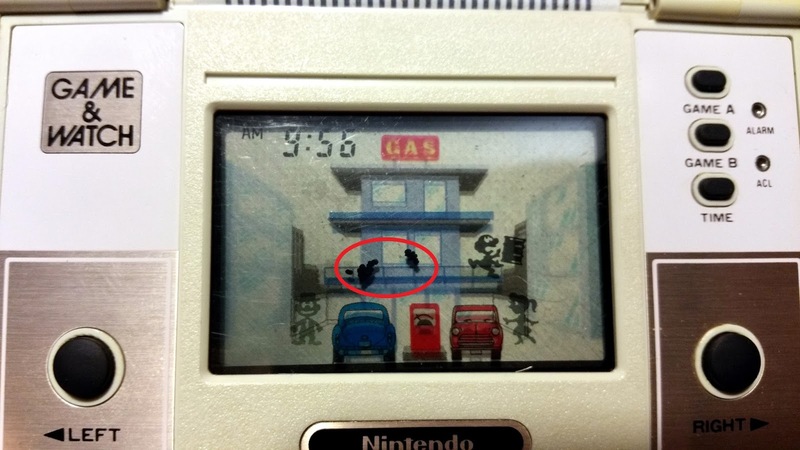 The Game and Watch screens have a few elements to them. From the very front layer to the back, you'll have the polarized film, one or two scenery panels (make sure you keep track of which end is up), the actual glass LCD panel, and behind that, a silver plate. More on that plate later. Open up the game. Be careful, these things are old and the plastic might be brittle. You don't want to snap off a screw post. 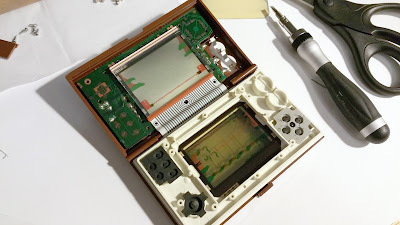 There are other walkthroughs online for how to disassemble these, but they are super simple, so you can probably figure it out. Do one side at a time. I did the upper screen first, since I didn't want to deal with the buttons. Behind the upper screen is a hefty metal plate to keep everything in place. You have to unscrew that and (gently) lift it off to get at the screen proper. Here's the new, untrimmed film next to the old, yellowed film. Use the old film as a template and cut out the shape. It's okay to cut a little big, you can always trim it to fit. Notice the pattern of notches at the corners of the film--it'll help you orient it properly when you reassemble (I think the one in the photo is upside-down). Button pads like to fall out. Watch out for the metal bits--they disappear quickly. In the photo above, you can see how everything's laid out. I opened it with the button console down (in 'closed' position). 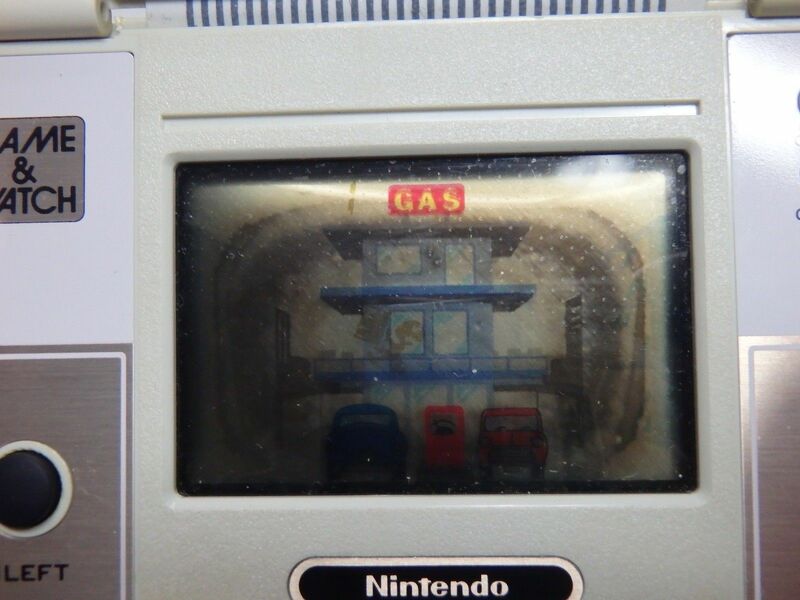 The LCD still has the silver backing behind it, and there's a second scenery panel between the silver backing and the glass LCD. Then, still in the button console, the foreground scene panel is on top of the polarized film. That polarized film also serves as a sort of screen protector. It's the cheapest, most replaceable part of the screen, so if it gets faded or scratched, it's not a big deal to repair. Pop out the scenery panel and the old polarized film, and throw your new polarized film in place. Be careful--the polarized film will have a thin layer of protective plastic over one or both sides. 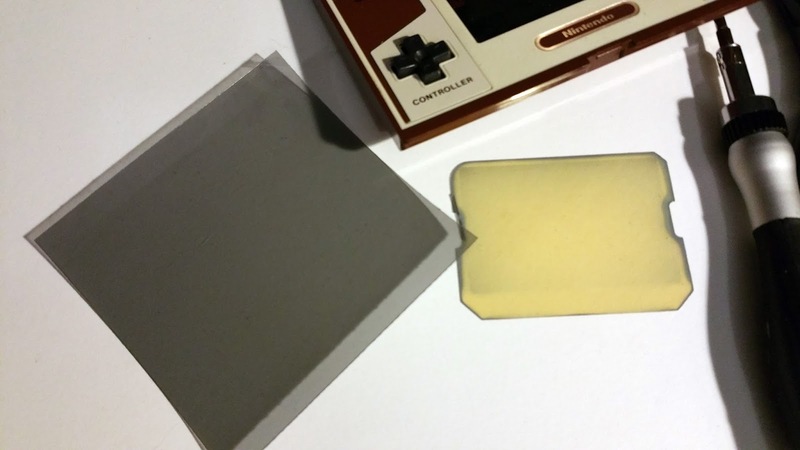 Peel off that protective plastic before you install the film in the game. Then carefully sandwich the game together (I had a devil of a time with this--the layers of plastic kept sliding around, so sometimes a scenery panel stuck out too far, or the polarized film popped out and got in the way. Just be patient, keep everything lined up, and fit the screen and button console together. Once they're together, hold them that way and take a look at the screen. 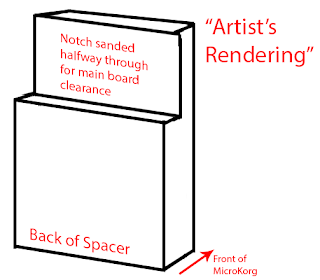 In mine, the front scenery panel kept sliding up, exposing way too much of the black border. If the panels look pretty centered, screw the game back together. And now you can see Junior. 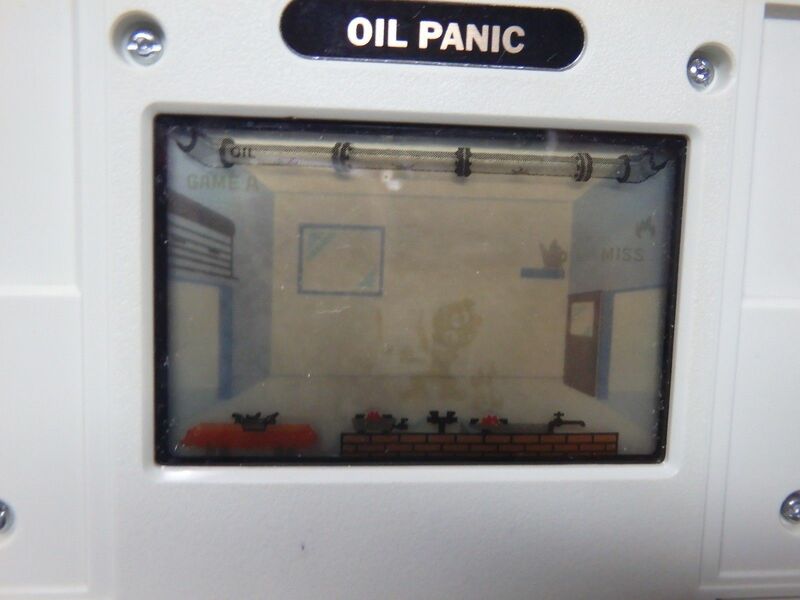 Remember the silver plate behind the screens? Not the hefty one keeping the top screen in place, but the little one behind the LCD that makes the screen look silvery. That's also replaceable. 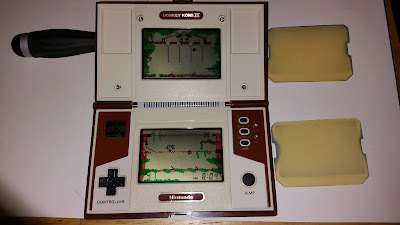 If you have a Game and Watch with a circular stain behind the screen that almost looks burnt, that's a good indication that moisture got into the game at one point and now the silver plate is tarnished. You can buy replacement silver plates for about $4 plus shipping from a guy in Spain who sells Game and Watch repair parts on eBay. I got a few to fix an Oil Panic game. Not too bad! Of course, with the silver plate replaced in the lower screen, the upper screen looks dingy by comparison. I'll have to open it up again and replace that one. Look closer at the lower screen. I'm a little peeved at these blotches (nobody's fault, just annoying). This is one of the things you just can't fix: screen bleed. This game isn't bleeding too badly, and if I keep it relatively climate-controlled, it shouldn't get much worse. But knowing I can't fix it is a little galling. Thankfully, this is a wicked little game, so I never really have time to notice these blotches while I'm actually playing. I'm too busy yelling at the little guy for never being where I need him to be when I have to empty my bucket. Well, that's that. I hope this writeup was helpful and/or enlightening. 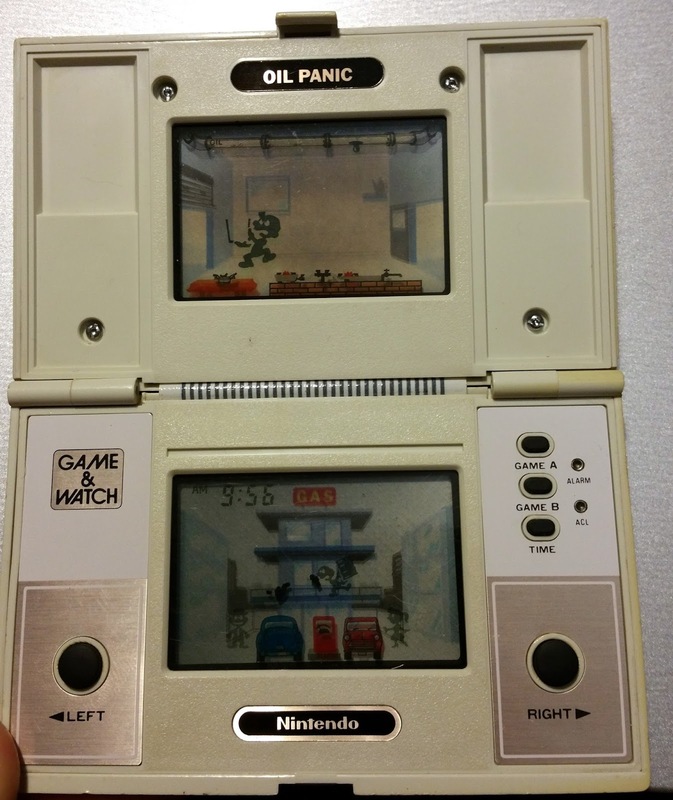 These Game and Watch games are really well made, easy to maintain, and a lot of fun to play. If you have a broken one sitting in a drawer, take a closer look. You might be able fix it up with a few bucks and around 30 minutes. Wisconsin and its bipolar vortex. I live in Wisconsin. It's known for its cheese, its football team, and a broad, stereotyped midwestern accent that I don't share. Story time: A nice elderly German couple once stopped me for directions, which I was happy to provide. We chatted a little more, and she asked me what country I was from. I told her I was American. She asked if I was a native Wisconsonite, and I said no, but I have lived here most of my life. They both complimented me on my diction. I'll just say, speaking of stereotypes, when Germans compliment my diction, I take that as high praise. Anyway, Wisconsin. It should be known for its maple syrup, but it's not. And every so often, when we're slammed with some sort of Lovecraftian weather system, Wisconsin is known for its bizarre climate. It's hard to believe we're farther south than beautiful, temperate Ireland. Since I don't know you, let's talk about the weather. 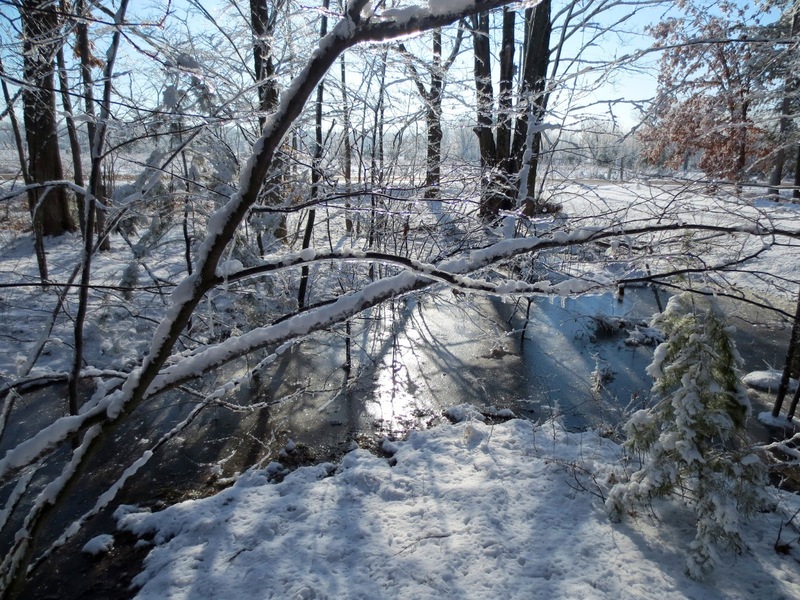 Winter of 2013 was especially impressive, not for its severity (though we did have a two-month stretch where the temperature dipped well below freezing every single night)--but for its tenacity. There's been a lot written about it already, and I figured now that we're in the clear (it's almost May and the snow is finally gone) I'll add my brief two cents. Walking in a spring wonderland. It had just started warming up a little, when we got the middle finger from Mother Nature: an ice storm. I woke up the next morning and our yard looked like this. It was pretty, but it was also the fifth of April and we were all sick of this crap. The bizarre thing was that, even though everything was covered in ice and snow, it wasn't really that cold out. Like we lived in Arendelle on coronation day. And this stuff stayed around for the entire day, just in case we felt nostalgic for...I don't know, the previous month? Seriously. This is the same spot, 36 hours later. Yup. All of it was gone. 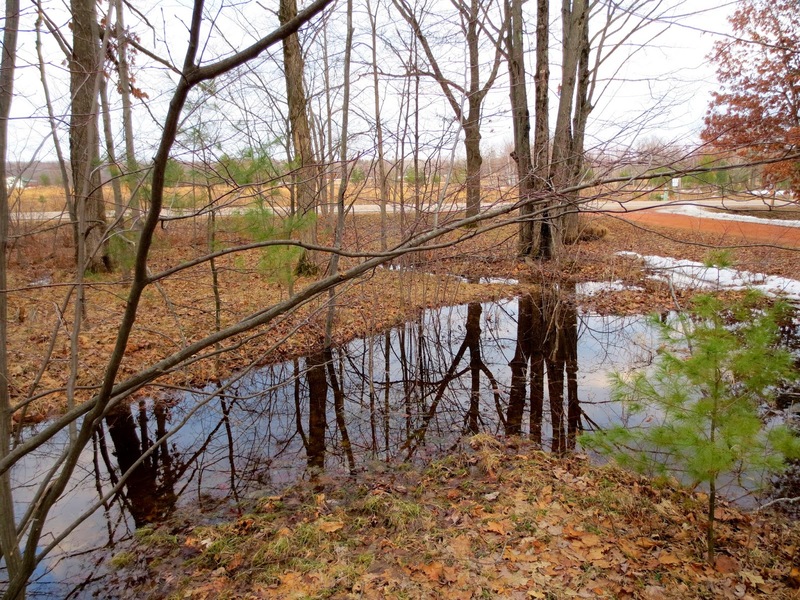 The rest of the week was kind of chilly, and a little rainy, but overall we were happy to be rid of all the snow. Then Saturday came. Wisconsin, you are a cruel, cruel state. Before you ask, that photo was taken from the exact same spot as the first two, one week later. 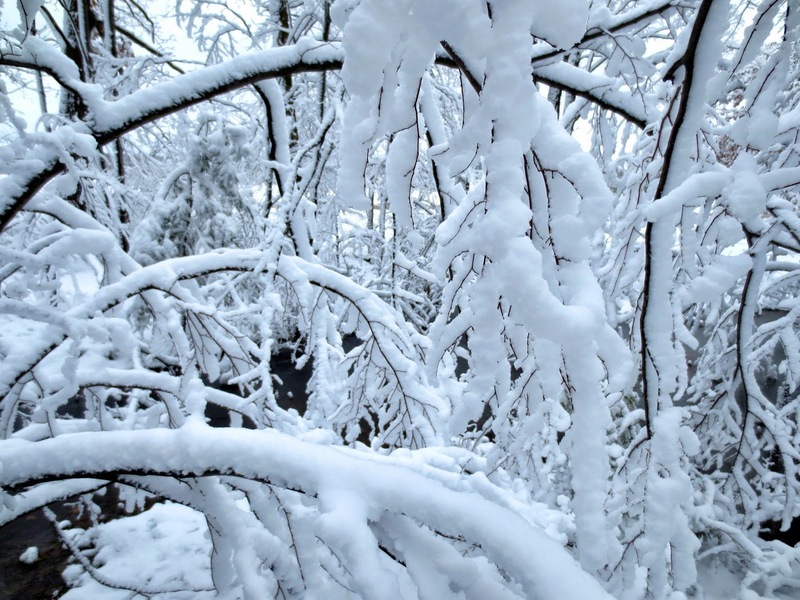 There was so much snow it weighed down all the branches. When a breeze picked up, I got big clumps of snow dumped on my head. I could talk about climate change, or throw around the term "polar vortex" just like everybody did for every change in weather since we weathered the real polar vortex. Seriously, people. Not every cold snap is a "polar vortex." Instead, I'm going to blame the ridiculous weather on the fact that Wisconsin seems to have the market cornered on serial killers. The state is trying to get the next batch to move somewhere else. Like Iowa. As I write this post, it's cold, raining, and so windy the house creaks like it will collapse at any minute (yesterday, by the way, was sunny, warm, and beautiful). And we're surrounded by trees that are blocking most of the wind, so I'm sure it's much worse than I know. Later this afternoon, the forecast calls for locusts and a rain of blood. I'll probably have to wear a hat. So hi. Welcome to my little discussion of what I did to completely pervert and otherwise destroy a 114-year-old work of art. It all started with Mary Robinette-Kowal. She has an old Singer puzzle box that she carries around as a sewing kit, because she is (among many things) an awesome seamstress and a lover of antiques. She brought it out and showed it off, and I immediately fell in love with it. 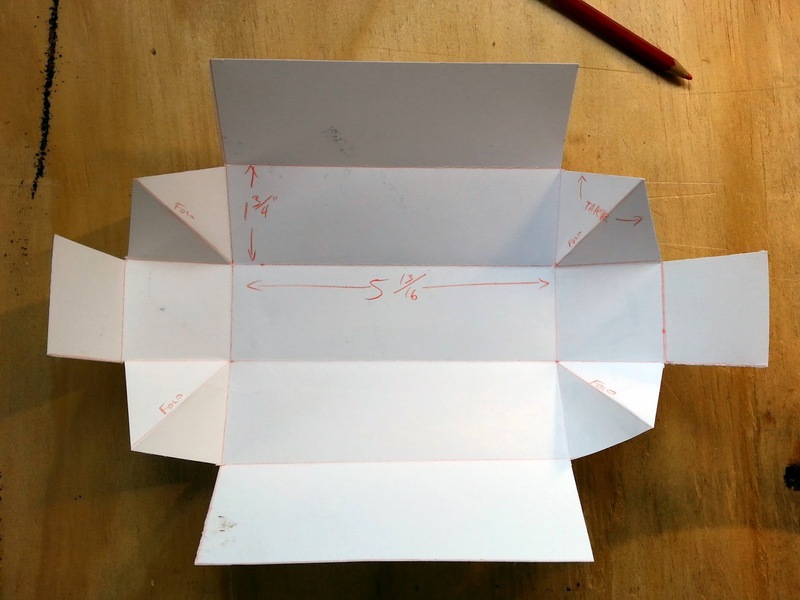 The way the box is designed is elegant and straightforward. Anyway, I usually have a bag with me, but not all of them have little pockets for smaller stuff (and one of them just has open pockets), so I need to have a bag-within-a-bag to carry cables, chargers, medication, and so on. Enter Mary's puzzle box. First, a little history. The Style box was invented by John Greist when he worked for Singer toward the turn of the (last) century (it was patented in 1889). It was an efficient way to organize all the extra feet and attachments your Singer sewing machine needed to do stuff like ruffling and hemming. It was designed to fit neatly in one of the drawers on either side of a standard treadle machine. Singer never called them "puzzle boxes," but it's a cool name for 'em. 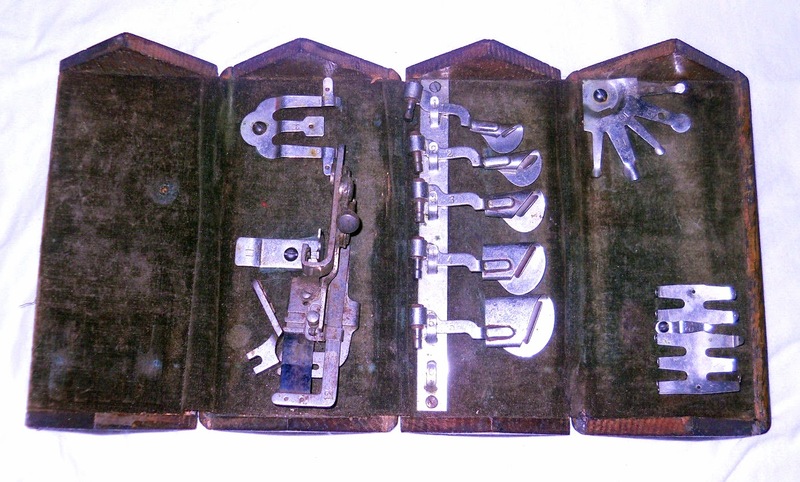 My particular box, which I scored on eBay, is probably a #3 (the numbering is based on the assortment of tools and when it was produced). 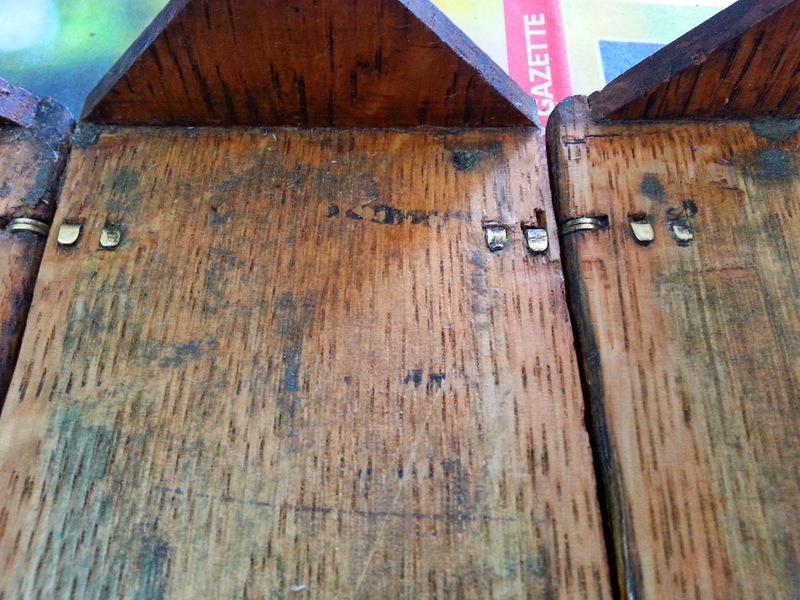 Later boxes had a spring clasp that kept it shut, and earlier boxes had a small hook that would swing into place in the upper right corner of the box. All that's left of my hook is the little brass brad it used to hook on and a hole where it used to mount. My box came with a random assortment of attachments, but my 1943 Singer probably can't use them. I just wanted the box anyway. This is the auction photo. I'm not sure what the large foot attachment is on the left, but the row of devious-looking implements in the third section are for different hem depths. It arrived quickly and nicely packed (thanks, seller!) but smelled like it was over a hundred years old and stored in a barn. There was some corrosion on the tools, it was missing a couple pieces of mounting hardware, and I was absolutely thrilled to get it. After some ooh-in and aah-ing, I went shopping for supplies, then started planning. 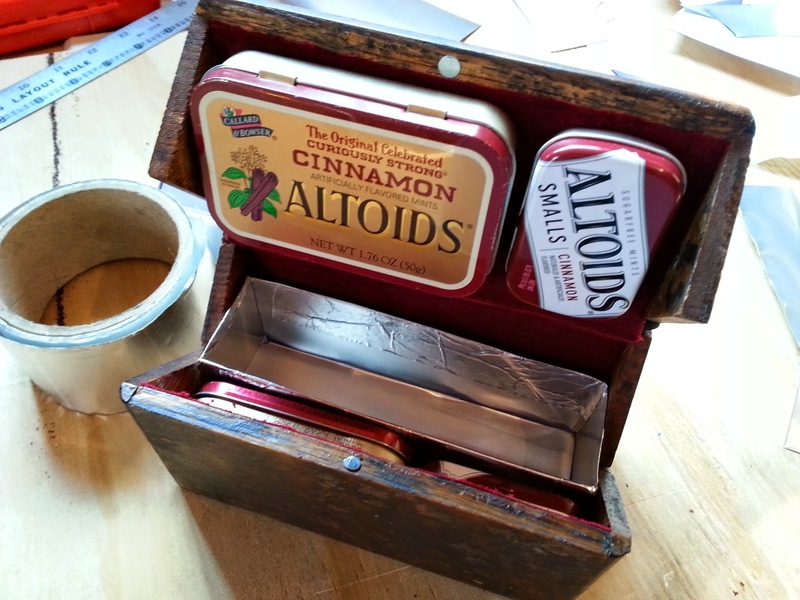 I unscrewed most of the mounting hardware and brought out some of my Altoids tins to see how I could use the space. After a lot of rearranging and test closing, I was happy with a layout and grabbed a photo. Since it was 1 in the morning, I figured I'd better label everything while I still thought I knew what I was doing. Notice I still have one of the brackets in the second-from-bottom section. At that point I was planning to keep some of the original hardware intact, and I found that two Altoids tins fit back-to-back against that bracket, which kept them nicely in place. Ultimately, I decided that the original hardware took up just enough space to offset its usefulness, and it had to go. 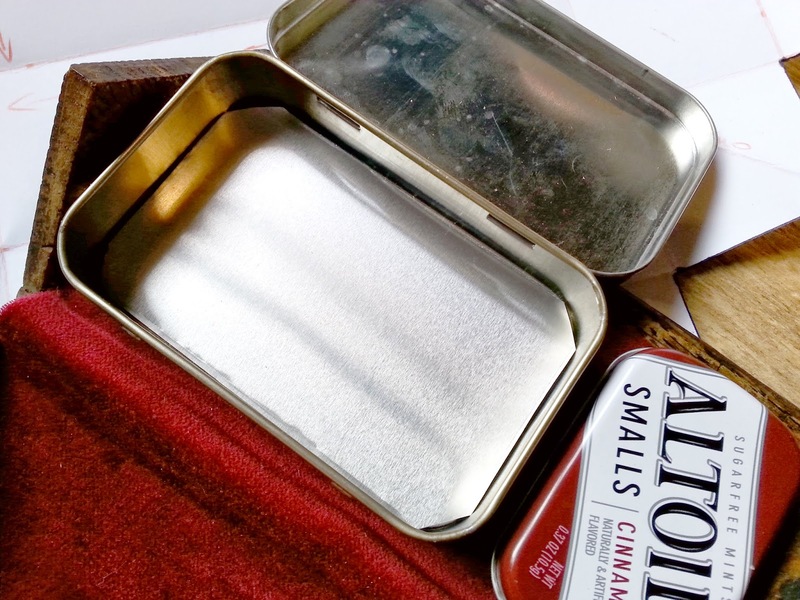 I needed one full-sized Altoids tin, two Altoids Smalls tins and one Altoids Gum tin. That would give me enclosed places to put little stuff (sewing needles, aspirin, etc.) 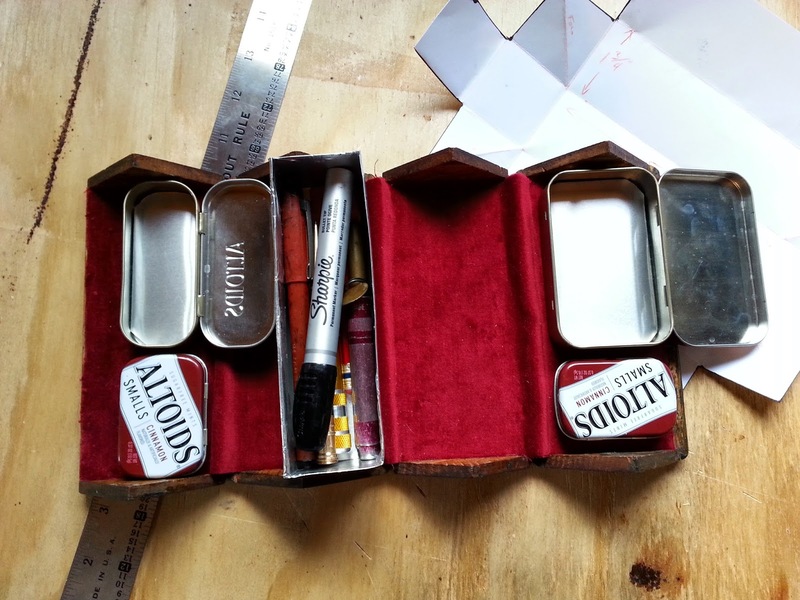 and leave a 6" x 1.5" x 1.5" space in which I could store pencils and other stuff that was a little too big or oddly-shaped to fit in a tin. 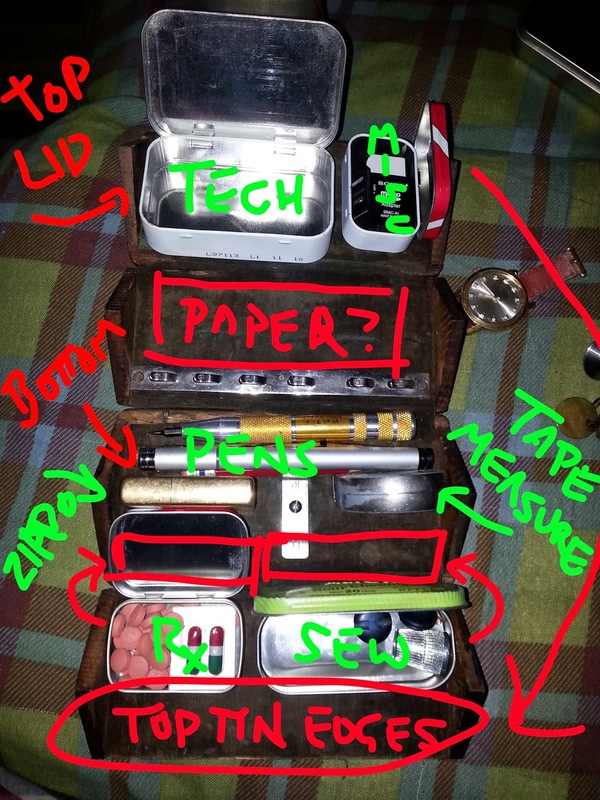 I figured I'd have space for a USB drive, phone charger and cable, extra memory card and a USB-A to USB-Mini B adapter (to plug the USB drive directly into my phone), a sewing kit, a tin for aspirin and allergy pills, some Band-Aids, writing utensils, a Zippo, a 3-foot tape measure, keychain light, and a small pad of paper. Time to get supplies. When I was shopping, the only velvet I could find that wasn't gaudy was a deep burgundy, not the forest green I was hoping for. 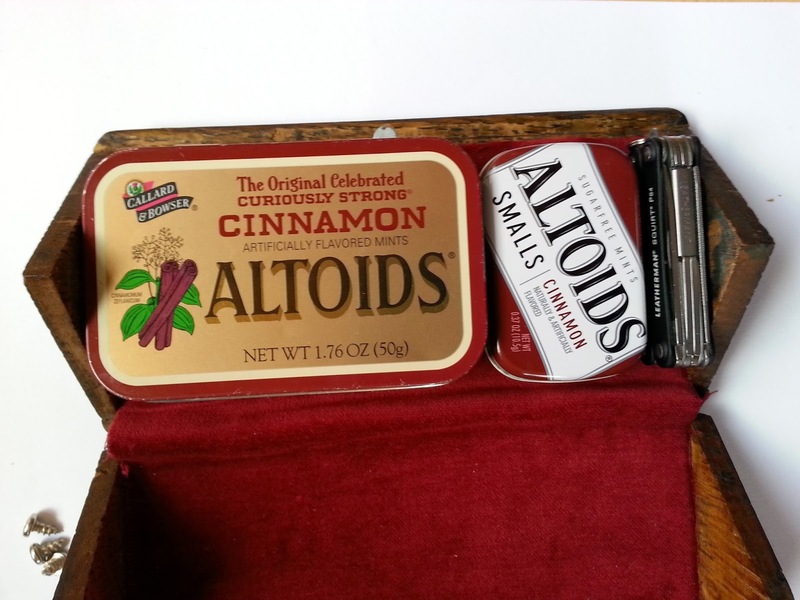 So to match the burgundy, I decided to use Cinnamon Altoids tins (insert OCD jokes here). The hide glue was difficult to find locally, but I wanted to use it for two lame reasons: authenticity and thickness. 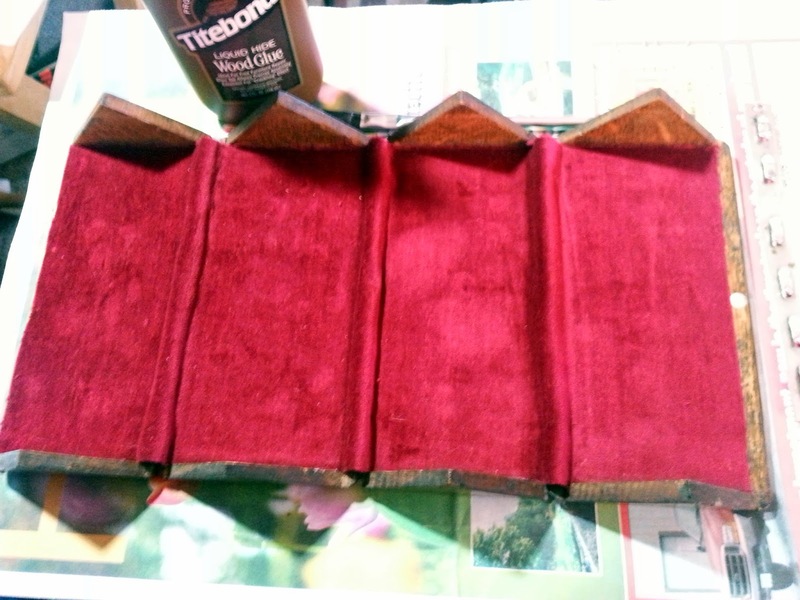 The hide glue is thick enough that it won't soak through the velvet. Since the original velvet had been glued in place, I assumed hide glue was the stuff and I was determined to do the same. The furniture tack and magnet I had lying around, so I decided that would be my new latching mechanism. Sadly, the magnet is too weak and doesn't line up exactly with the tack head, so I'm going to have to order a stronger one. It works, but I want it to work better. First order of business: get rid of the old stinky velvet. I tried warming it with a heat gun, but no dice. But I was able to peel it up a little, so it was putty knife time. Ick. That's the magnet on the left edge, there. I knew I was going to sand it before I glued anything, so I wasn't worried about scratching the wood. I also didn't want to gouge anything, though, so it was slow going. Once I got the velvet out, I was able to see how the invisible hinges attached. Like the rest of the box design, they're pretty simple. They just tab through slots in the wood and bend over. A couple of them were loose, so I tucked some Super Glue gel in and let it dry. That didn't work. But they're not horrible, and it's not like I plan on abusing this thing, so I left them. There they are, the little darlings. A little rub down with alcohol to get rid of any weirdness, and it was time for the new velvet. I measured it out, adding an extra quarter inch for the seams. 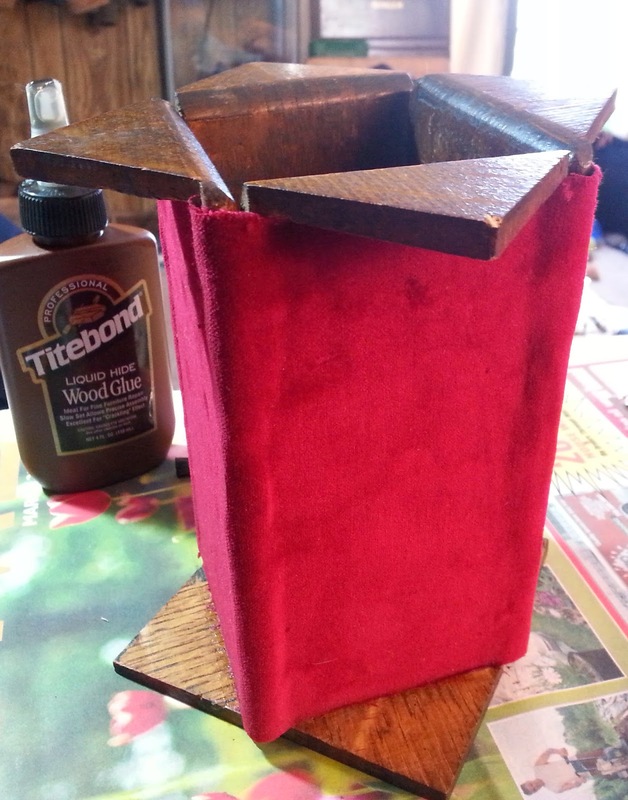 The original velvet had been glued in, leaving puckers at the seams so the box could fold backward without stressing the lining. Cut and laid out for width. I glued from left to right, spreading a thin layer of hide glue with a brush, glueing down one section at a time. I bent the previous section back 90-degrees so I had the right amount of slack at the joints. By the third section, I realized that I needed to leave at least 1/8" unglued on either side of the seams or the fabric couldn't pucker correctly when the box closed. When glued to the edge, the fabric would get pulled into the seams as the box folded, keeping it from closing. Hide glue is pretty forgiving, and I was able to gently pull it up a little with a screwdriver. And it even bends around. Yeah, I used liquid hide glue. I didn't want to fiddle with a tiny double boiler. It still stinks to high heaven. I let the glue dry for a day, then it was out to the workshop. I laid everything out flat and did another test fit. There was enough clearance for the lids to open, and I did more box opening and closing just to make sure my layout was sound (1 a.m. planning, and all that). I was a little worried at the extra fabric along each seam when the box closed--I'd have to scoot the tins a little farther to give it the extra room. I knew I was going to be carrying a Leatherman PS4 multitool in this box, and it seemed like I had some extra space on the top lid (the right hand side in the photos). Could I wedge the tool in that space and have it stay? But that introduced a couple new problems. I had to remove the tool completely before I could open the Smalls tin. 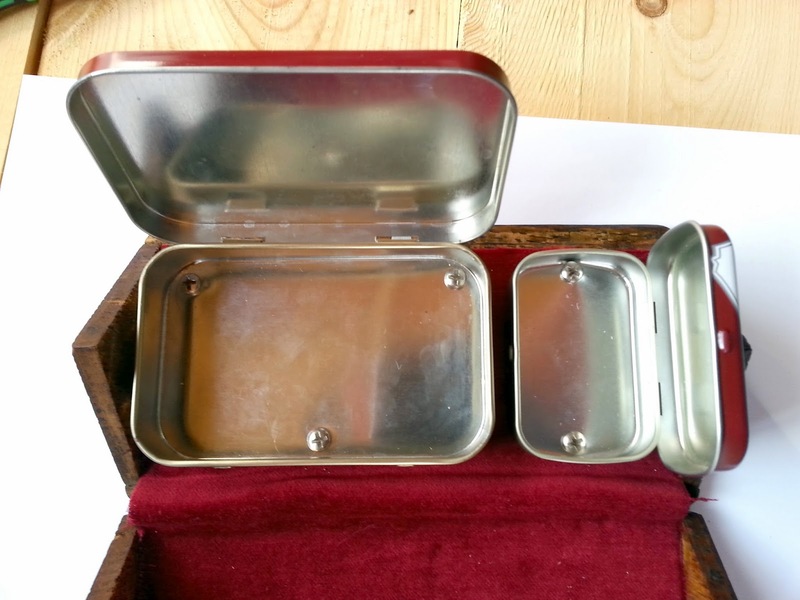 I also had to open the standard tin in order for the lip around the Smalls lid to clear the lid of the standard tin. That would be a pain, when the Leatherman could just as easily stash in the pencil box or one of the tins. So I scrapped that idea and opted instead for a little breathing room around the tins. 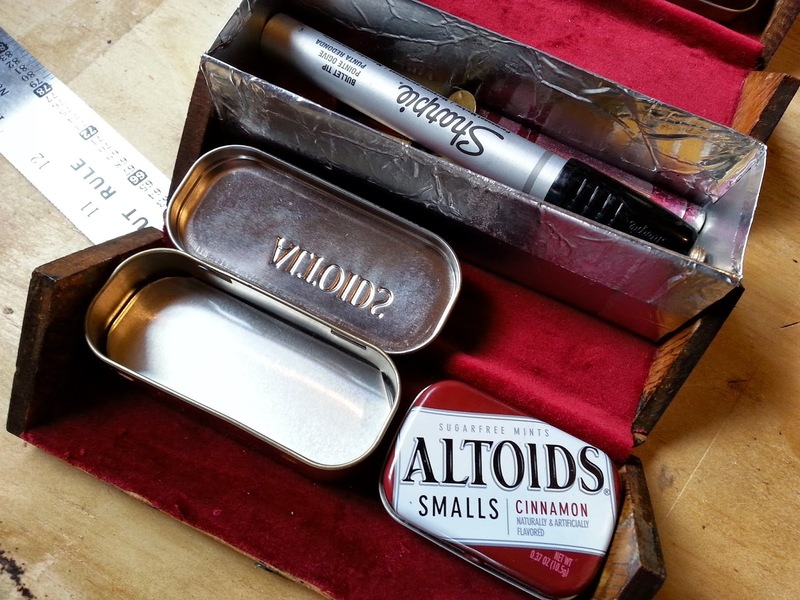 Then I marked where I was going to pre-drill the holes in the Altoids tins. I figured the holes would be a bit smaller than the diameter of the screws, since the tin is pretty forgiving. Later I was glad I did it that way, since the tins on the right hand side (the front panel of the box) had very little clearance and I had to widen the holes a bit for adjustment. 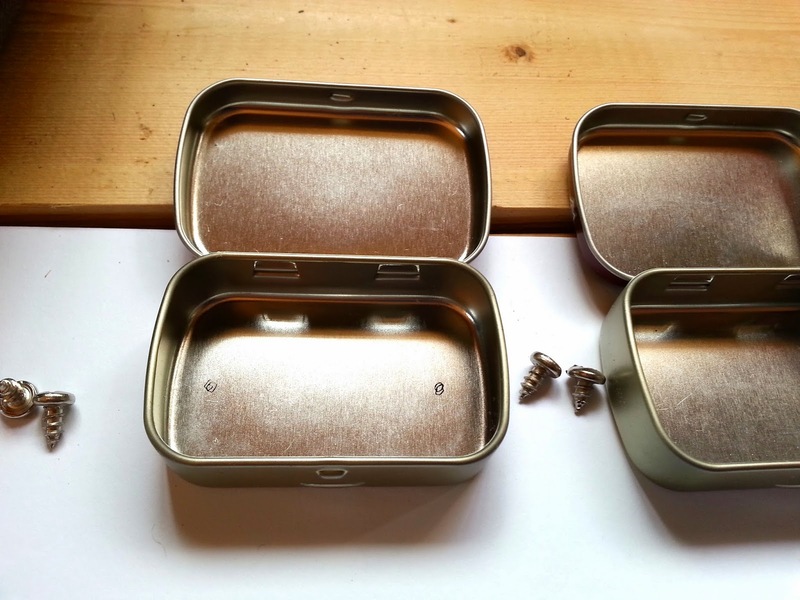 Two holes for the Smalls tins, three for the bigger tins. I tried to keep the screw holes as far to the edges as possible, since the heads of the screws stick up about 1/8" from the bottom. I didn't want to eat up any more space in those tins than I had to. 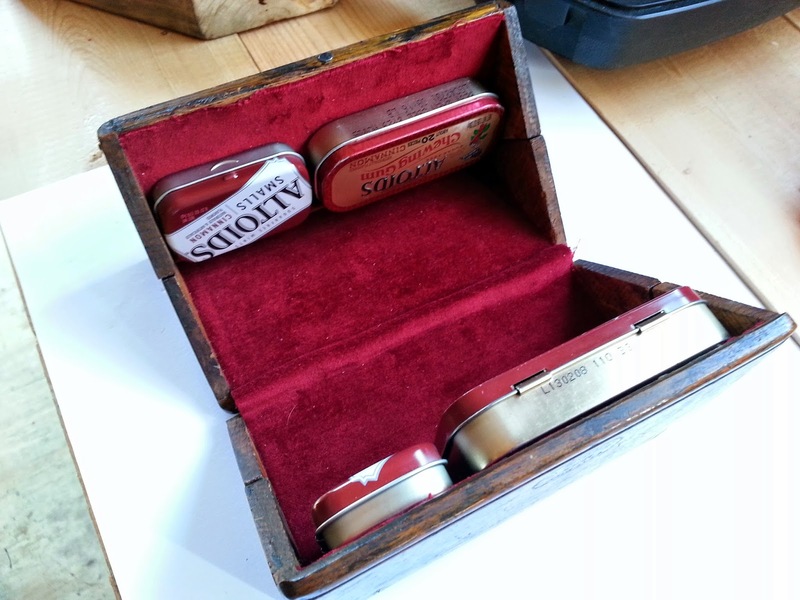 My original plan was to use 1/4" brass tacks to fasten the tins in place, but that would be much more permanent, and I wasn't sure I wanted to risk splitting the wood. 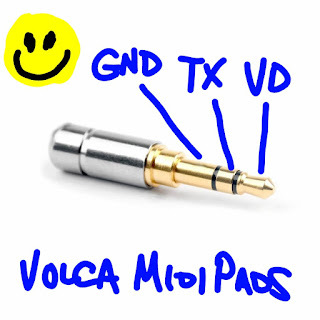 I could have predrilled holes for the tacks, but I figured if screws were good for Singer, they're good for me. I was also more confident the screw heads wouldn't pull through the tin after a while. I placed the tins on the box and held them in place while I opened and closed it a paranoid number of times. Finally, when I was satisfied, I used a Sharpie to dot the velvet through the holes. Then I grit my teeth and started drilling the 100-year-old antique. before I punched a hole through the box. There--enough clearance for the lids to open independently and stay open on their own. Now for the other section. More panicked lining-up and holding the tins firmly in place so they wouldn't shift at all while I marked the velvet through my pre-drilled holes. These two tins needed some finessing. There isn't a lot of clearance between them, and I wanted them to open independently without rubbing the sides of the box. The Smalls tin still rubs a little, but I convinced myself it's to make sure it stays firmly closed. The bottom of the gum tin is mottled because it was punched in for some reason and I needed to flatten it out to screw it down (and give me a little more storage room). 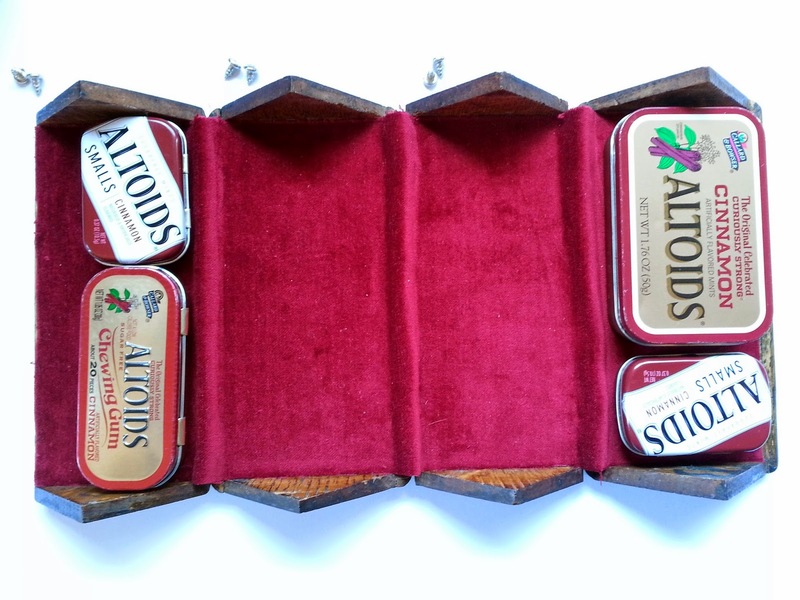 Altoids discontinued their gum years ago, but Adafruit still sells the tins for some of their projects, with the added bonus that they keep the bottom flat. I tested the box to make sure it folded well with enough clearance for the tins. I knew it would work after all my paranoid measuring and testing, but I had to do it so I could be all proud of myself. Since I couldn't find a pencil box the right size (they're all so darn long), I figured I'd use some aluminum sheeting to make myself one. 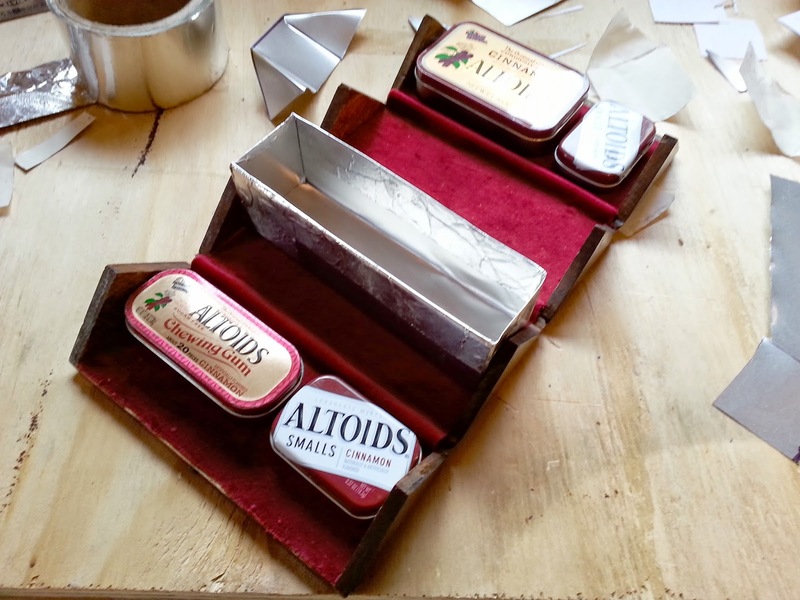 I took some measurements with the idea that any space not taken up by Altoids tins would be home to the pencil box. I wasn't going to screw down the pencil box in case I felt like upending it to find a particular item. It would fit snugly enough that I wouldn't need to fasten it. Paper first. Plenty of time for mistakes later. The sides are all 1.75" deep, and I marked the box itself 5 13/16" wide. Don't do this if you're making one--it's 1/8" too long. The paper buckled, so I shortened it when I cut the aluminum. 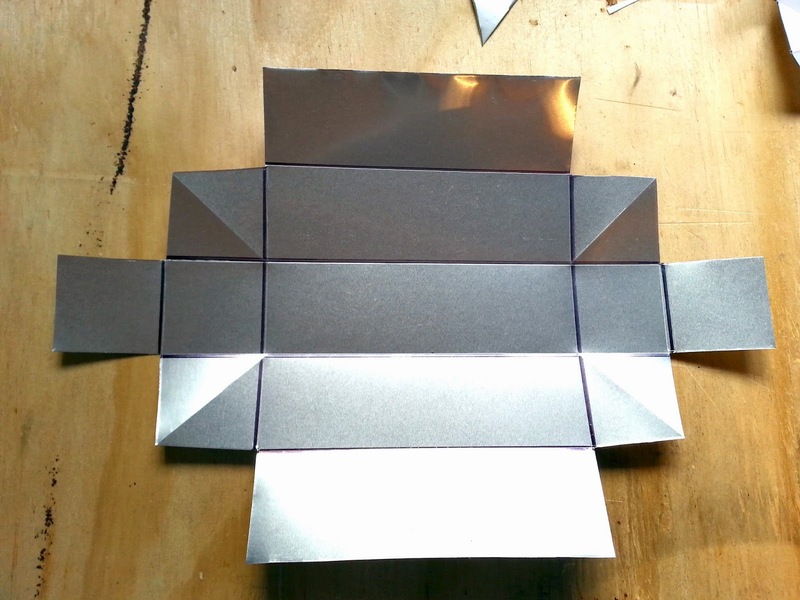 Once I was happy with how the box fit, I re-traced the paper version onto a sheet of aluminum. Be careful you don't lose any fingers. This stuff is sharp. 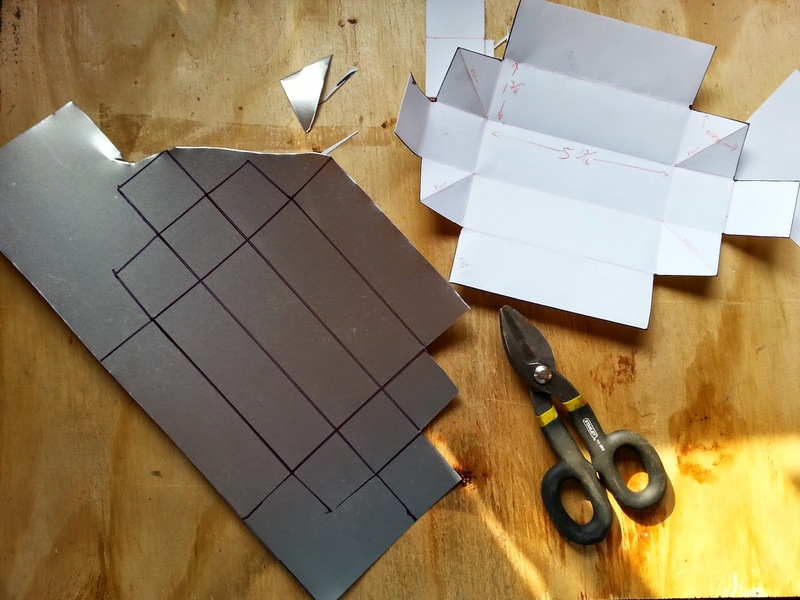 Once it was traced and cut, I figured I'd pre-score the edges so it would fold together without too much trouble. This was an awesome bit of forethought that I congratulated myself for silently as I scored all the seams. thus eliminating sharp edges on the outside. It was also a learning experience, where I found out a Universal Truth. Don't ever score aluminum. It just snaps when you try to fold it. Luckily, I have a roll of aluminum tape around, and I was able to put together a Frankenstinian creation that will do the job. So with the slightly shortened, badly folded and ultimately taped-together pencil tray finished, I tried it on for size. 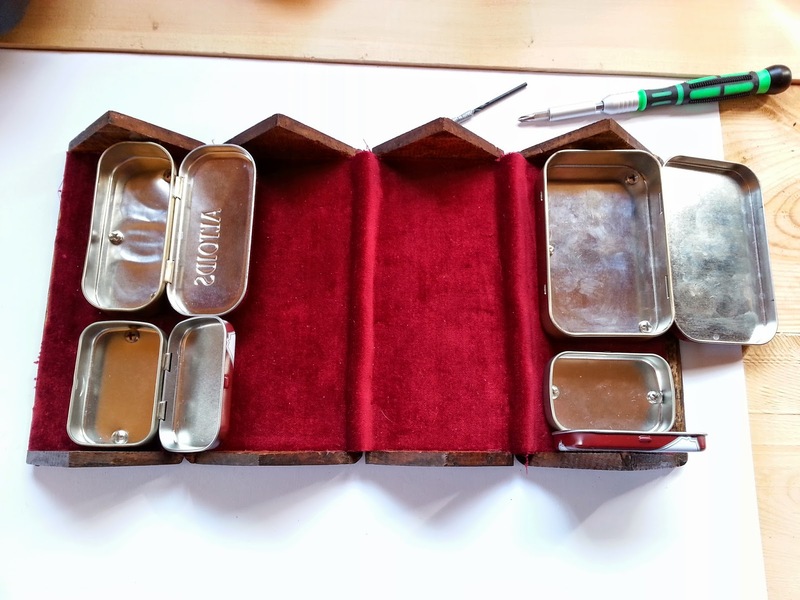 The pencil tray comes up to the top edges of the gum and Smalls tins, meaning that when the puzzle box is closed, the standard tin covers 2/3 of the tray nicely. If I have anything a little taller than the tray (like the USB charger for my phone), I can tuck it under the Smalls tin and have a little extra clearance. And it fit all my basic writing utensils pretty well, with plenty of room to spare for other random stuff that might not fit in one of the tins. Notice I swapped the two tins on the left hand side. I didn't mean to. 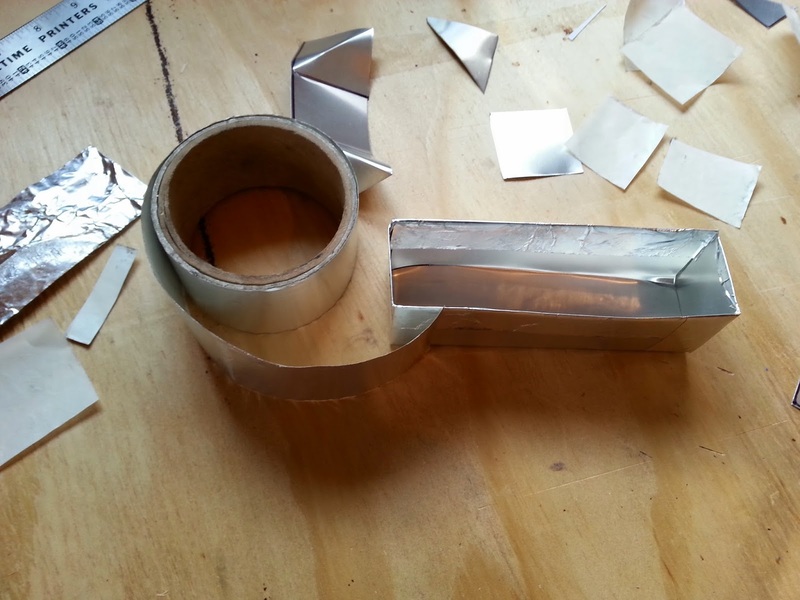 I had some extra aluminum from the bits that broke off my pencil tray, so I trimmed them a little, cut the corners off, and used them as liners for the two larger tins. It covers up the screw heads and provides the opportunity for me to sneak a business card or something under the false bottom. I almost wrote "money," but who am I kidding. I don't have anything like that. It also covers the rippled bottom of the gum tin. Then the fun part: filling it with crap. I was happy to discover that all the little stuff I actually wanted to carry in this box didn't fill up the space. 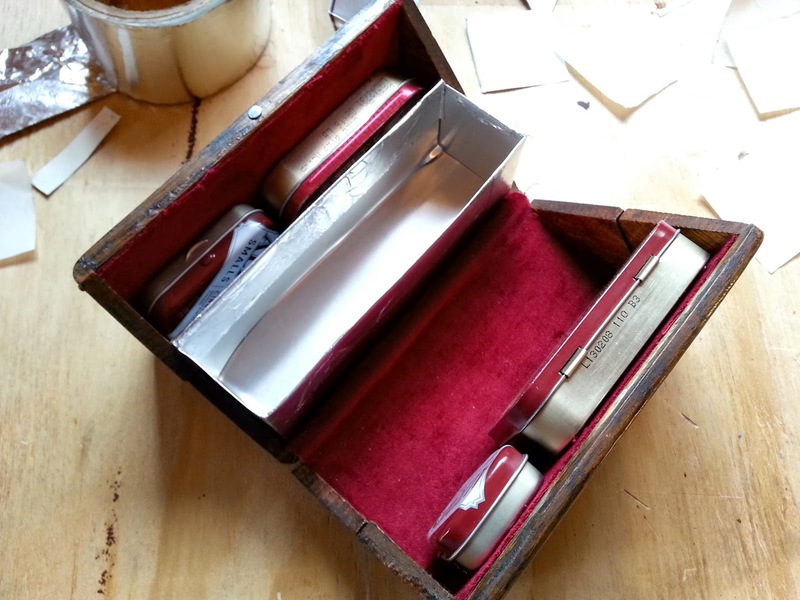 The gum tin was empty, I had extra space in the pencil tray and almost half of the standard tin was unused, even with the Leatherman in place. So I just dug up some junk to fill it. Half the fun is fiddling with the contents and placement so that it all fits well and is easily accessible. In a week or so, the contents pictured above will change. I'll probably empty out the pencil tray a little (I really don't need a watch or a lighter there), add another color thread to the sewing kit and then wait to see what I might have to add for real. But for now, I'm just tickled it works. I still have to swap out the magnet for something stronger, and I'll probably buy a sheet of brass I can use for a nicer pencil tray. I'll taper the top of the next tray in a little on the sides for better clearance when the box closes. Brass will go better with the velvet and cinnamon tins, anyway. It even still smells like cinnamon. Instead of death. And that's it. I'm not going to refinish it, since I like the visible mileage it has. I may try to find a tiny hook to restore its original clasp, but I'm kind of hoping the magnet will work to my satisfaction after all. I hope I haven't horrified any antiques or Singer enthusiasts. The original velvet served well for over a hundred years, but it was smelly and ratty, leaving behind odd furry bits when I touched it. I still have the hardware from it, as well as the blued steel screws (I wanted to find some like them to fasten down the tins, but no dice). 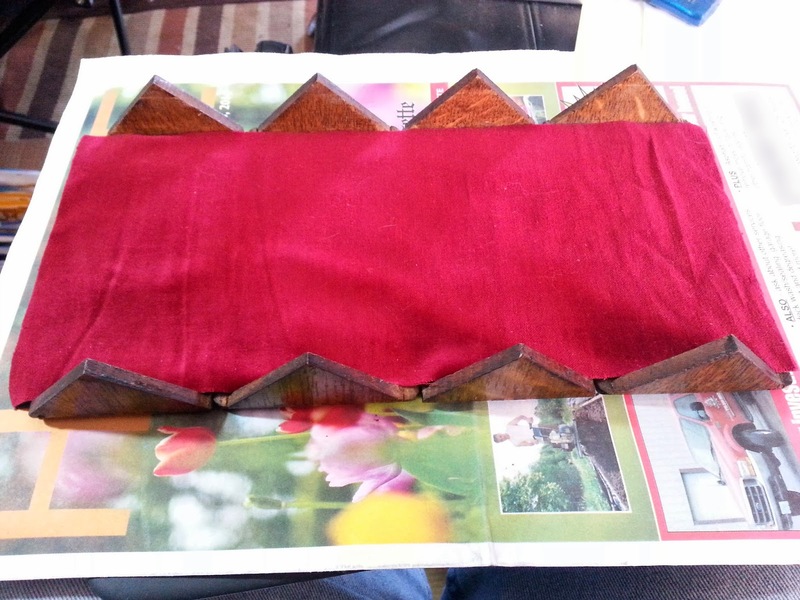 In the end, I glued down new velvet, drilled 12 holes (two were for the magnet and furniture tack) and that's it. The original holes are still there under the velvet if anybody feels like using it as a Singer tool holder in the future. For now, I'll just be hauling it with me as an all-purpose kit for whatever small task I might have.